The mercurial writer John Michell was a prominent figure in the study of ‘Earth Mysteries.’ In his lifetime he published over forty books, first appearing in the pages of the British underground newspaper International Times in 1967. His first interest was in the study of unidentified flying objects and how they related to the ideas of Alfred Watkins who had published ‘The Old Straight Track’ in 1925 (Methuen) concerning the idea of energy lines in the land (ley-lines). Ley lines is the concept of invisible energy lines (meridians) that run through the Earth just as in Chinese medicine there are meridians in the human body. When John was 35 years old he published ‘Flying Saucer Vision’, the first of three books that developed his understanding of the earth mysteries. ‘The View Over Atlantis’ followed in 1969 and Paul Screeton wrote that it was a work which ’re-enchanted the British landscape and empowered a generation to seek out and appreciate the spiritual dimension of the countyside, not least attracting them to re-awaken the sleepy town of Glastonbury.’ This Michell concept inspired much further writing such as Janet and Colin Bord’s ‘Mysterious Britain’. Michell’s theories developed further in 1972 in ‘City of Revelation’ which encompassed sacred geometry (a study that is very much alive and still unfolding) numerology, gematria and the Blakeian idea of a New Jerusalem in Britain. Michell believed in the reality of an ancient spiritual tradition that connected humanity to divinity and that this tradition has been lost as a result of modernity and technological progress. Yet he was still optimistic believing, like Blake, that we would eventually enter a golden age with Britain at the centre of this transformation. In 1969 he founded The Research Into Lost Knowledge Organisation (RILKO) with Keith Critchlow and Mary Williams. 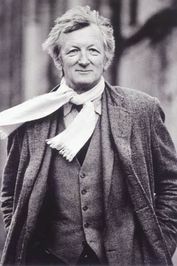 He advised on the dimensions of the original pyramid stage at Glastonbury Festival, founded the Cerealogist magazine in 1990 (devoted to the study of crop circles) and from 1992-2009 wrote a marvellously cantankerous column for The Oldie magazine continuing in the eccentric non-conformist traditions that so fascinated him. Typical of John’s writing are the final words of ‘The View Over Atlantis’: ‘Through the rediscovery of access to the divine will, revealed in the processes of natural growth and movement as well as in the direction of evolution, the principles of true spiritual science may be re-established. The life essence, the etheric current, the ‘universal plastic mediator’, responsive both to the human imagination and to certain physical stimuli, provides the medium through which the Logos becomes manifest in the restoration of the Holy Spirit.’ This book too provides a fascinating bibliography that would provide a lifetime’s study for anyone who wished to undertake a study of earth energies.